After years of development, Channing Tatum's Untitled Evel Knievel Biopic finally seems to be moving forward, with The Tracking Board reporting that Darren Aronofsky has signed on to direct. Peter Berg was attached to direct back in April, but dropped out for unknown reasons. Channing Tatum's longtime producing partner Reid Carolin wrote the original screenplay, but that will now be rewritten by Scott Silver (The Fighter). Evel Knievel, born Robert Craig Knievel, became a world-famous stuntman and entertainer in the 1960s and 1970s. The performer got his start by jumping over crates of rattlesnakes and mountain lions to provide for his family. After performing on the state fair circuit in Indio, California, Evel Knievel suffered the first of his numerous injuries, which lead to his stunt troupe disbanding while he recuperated. He ended up going solo, jumping cars and other vehicles instead of animals, as he became a household name. Evel Knievel performed more than 75 ramp-to-ramp motorcycle jumps between 1965 and 1980, including a 1974 jump over the Snake River Canyon in the Skycycle X-2. He suffered more than 433 broken bones throughout his legendary career, earning him a Guinness world record as the survivor of most broken bones in a lifetime. The daredevil passed away from a pulmonary diseason in 2007, at the age of 69. Channing Tatum has been trying to get this Evel Knievel project off the ground for years. We first reported that the actor was set to star and produce the biopic back in 2012, at the same time as another biopic on Evel Knievel was being developed by former stuntman turned director, Ric Roman Waugh. It isn't known if that project is still moving forward or not. Sony, Film 44 and Trigger Street will produce the project with Dana Brunetti, Michael De Luca and Channing Tatum serving as producers. Darren Aronofsky most recently directed Noah for Paramount Pictures. Channing Tatum is coming off roles in Jupiter Ascending and Magic Mike XXL, and he will next be seen in The Hateful Eight. 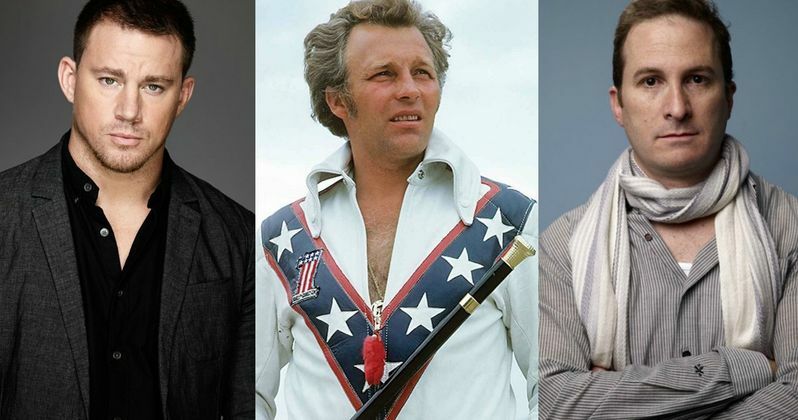 Do you think Channing Tatum will be able to bring Evel Knievel's story to life?